It is important to remember that one does not have a second chance to make a first impression, which is often represented by the employee(s) answering your telephone. Your answers, pleasantness, knowledge, and offer of assistance is invaluable to your business's success. Every company or organization in Aruba can participate in the election for the Interface Tele-Award . Since the telephone operators, secretaries and office clerks are the business cards of the company it is necessary to evaluate their skills. From the survey results, five organizations will be chosen. The jury will select a winner based on a number of requirements. The winner receives a prize, but most importantly excels your company to a new level of business through publicity provided by newspapers, trade journal, newsletters, radio and television. The winner will be announced on the "International Telephone Operators Day" March 10, . 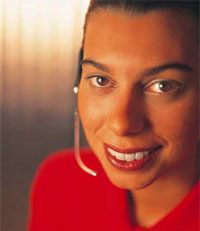 Category 1: Organizations with 1 to 2 telephone operators. Category 2: Organizations with 3 to 5 participants. Category 3: Organizations with 6 or more participants. If you are interested in the Interface Tele-Award or wish to receive additional information? We would be most pleased to send you the information.